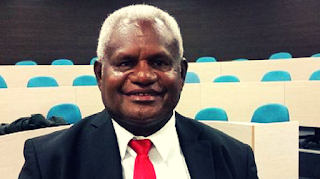 Papua New Guinea Transport and Infrastructure Minister Malakai Tabar has announced his resignation from Cabinet. His decision, which was revealed on Saturday, is in support of his National Alliance Parliamentary Leader, Patrick Pruaitch, who has been stripped of his portfolio as the Treasury Minister. Tabar made the announcement at a rally held in his Gazelle Electorate in East New Britain Province. His decision leaves the Transport and Infrastructure seat vacant at the moment. Hundreds of people attended the election rally, which was held at the Napapar 4 church grounds. Pruaitch, who was also there, told the crowd he had lost confidence in the leadership of the Prime Minister. "I will make an official response to my reported sidelining after discussion with NA's Parliamentary team," he said.